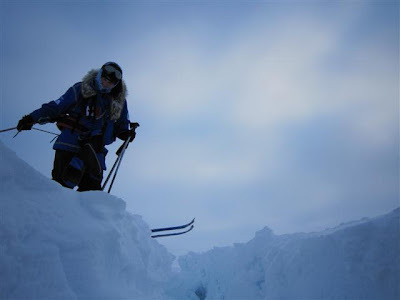 Day 8 on the ice – Mother nature is a tease…..
We woke up – and the first thing out of my mouth, even before the eye blinds were removed, before I thought of my morning coffee – was ‘positive or negative’ – this directed at Keith my tentmate – re drift – in fact we had drifted 1 mile towards the North Pole! Excitement was palpable. We got organized and broke camp, (much oatmeal eaten this morning), and started off. The wind picked up and the snow started. As we marched along -Mother Nature showed her true colours…..and there was water everywhere – we lost count of the leads – everywhere we looked. It was an incredible challenge. Keith went in (twice – but he is OK Stacey). We had to use the sledge as a bridge on many occasions. I managed again to put in my left foot (but just my foot). Between Keith and Dirk there is > 1500 miles of Polar experience – we have felt safe, secure and looked after the whole time. The ice age ranges from days (one of the leads we crossed), to about 3 years old. But overall the ice extent has been steadily diminishing in size, thought to be due to global warming. Some predict in 5 years there will be summer time free ice, i.e. 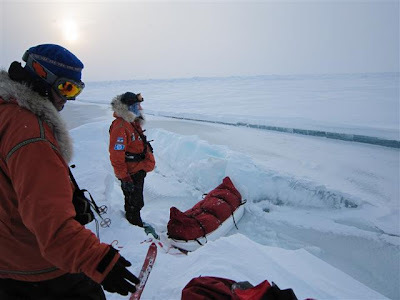 there will be no structure and ships will be able to pass through the northwest passage in summer. . Thankfully we have not met any animals – as we don’t want to see any Polar Bears. Mother nature indeed is a cruel mistress…. We set camp and the high point of the evening was Tomato soup with shredded Parmesan cheese – yummy. Two tents – Dale, Michel and Dirk in one; Keith and myself in the other (we are the cook tent and entertainment tent). Tonight we are back to Beef Stew. We burn about 6000-8000 calories per day, between the temperature and exertion – it is hard (but fun) to keep up. Hoping for much drift tonight. I'm having a great time reading the updates, and I've been rooting for you all to have positive drift and nice weather. Maybe have a polar bear sighting from a VERY far distance, and one that is bored with you, and wanders off on his own without coming any closer. Just so you can say you've seen one. Down here, I'm gearing up for the next “Test Your Limits” adventure in the Bermuda Triangle or the Bahamas (somewhere warm, please, but not Sahara Desert warm). I did three laps around the ward today! First time ever! I'm standing on my own, with no help, and stood without needing to hold anything today. Getting stronger every day, and hopefully I'll be raring to go for the next adventure! Keep going, and hopefully you'll reach the Pole very soon! Glad to hear the good news. Michel may already know the Habs are in the playoffs. L.G. Pugh already swam at the North Pole 3 years ago so please stay out of the water. Greetings from the UK where John and I visit the blog daily to check out your achievement and antics! What an amazing trip in a charming place. I am glad that you and your team are enjoying your time Heather and most of all that you are safe. Hope you will all comeback safe. Finally going the right way, yahoo…soon, the pole, enjoy and be safe. Love the pictures and commentary.Go Team. You are brave hardy souls. May you drift 2 miles towards the pole tonight. Keep safe. There are reports of brave folks swimming in Hawkeye and Cummins lake this weekend but please stay out of the Arctic Ocean. Well. Another day under your belt. 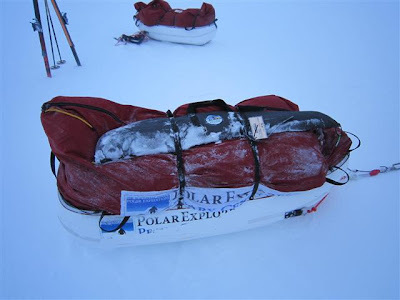 I wish I could think of something that would burn 8,000 calories a day that doesn't involve open water at sub zero temperatures.Glad all of you are fine and keeping each other going.The pictures do cause heart stopping times. Sonny and Susan send their love and best wishes as do all of us. One more thing. The picture that shows “H.R. ready to cross the breach,” was the photographer treading water or is the breach a deep ice crevous.